Ever since the latest Galio rework, you've doubtless seen your fair share of slick combos. Here's our top five favorite picks for the new Colossus, what are yours? 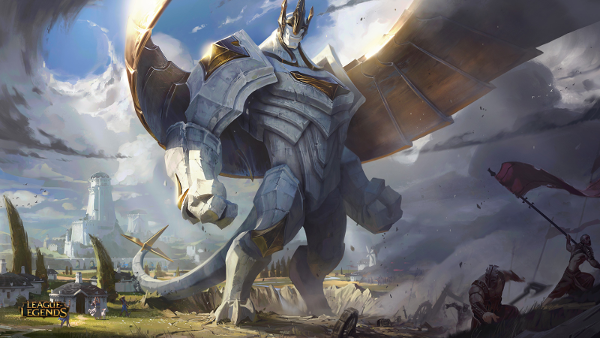 When you combine a rock solid knock-up with Galio's long range engagement, you get a massive double knock-up and massive quantities of crowd control. The best part is, with Galio's 40% allied damage reduction, turning on Malphite isn't an option...not that you can do anything to him even if it was. Single target deletion is Vi's main game. However, strong peel for the marksman can prevent her from accomplishing her mission. Combined with Galio though, Vi's would-be peelers just end up getting knocked up and smashed around for free. Similar to Vi, Yasuo can enter the fray for mass deletion, and a Galio follow-up ensures any enemies trying to help their allies end up getting crushed by the colossus. Meanwhile, if Galio ults a different ally, Yasuo can ult off of the Galio knock-up for massive crowd control. One of Galio's difficulties in landing great ultimates is getting an ally in good position for one. Using Shaco, Galio gets an invisible target to ult to at will, allowing for some very unexpected initiations. Similar to Shaco, Wukong provides an invisible initiation tactic. However, the difference between Shaco and Wukong is a reduced invisibility timer traded off for a massive AOE crowd control spell that you can chain together with Galio's ultimate. Countering Galio sems to be mostly a matter of poke damage or high mobility. This means that champions like Ahri or Ziggs work well by delivering high amounts of damage before Galio's ultimate can land and dominate their team. What do you think about this Galio? Got any other favorite combos? Comment below! Click here to check out more Combos!